The Alexa Skills Kit enables developers to make custom skills for their apps and Alexa Voice Services are used to integrate the intelligent assistant directly into their products. Amazon has extended its Alexa Skills Kit (ASK) and Alexa Voice Services (AVS) to India and it enables developers to start creating voice experience for Alexa customers here. ASK is a collection of self-service API’s and tools that enables users to create functions for Alexa. Indian companies such as Ola, Saavn, Goibibo and many more are building their own dedicated “skills” for Alexa. These skills allow users to perform various functions using speech. The AVS is used to embed Alexa into their product and devices. Amazon today announced the expansion of the Alexa Skills Kit (ASK) and the Alexa Voice Service (AVS), enabling developers around the world to build voice experiences for Alexa customers in India. The Alexa Skills Kit (ASK) is a collection of free, self-service APIs and tools that make it fast and easy for developers to create skills, or capabilities, for Alexa. With ASK, designers, developers, and brands can build engaging skills and reach millions of customers in the US, UK, Germany, and now India. Anyone can design and build for voice, no coding knowledge is required. From daily news updates, to interactive games, to smart-home integrations, developers from India and all over the world are creating voice-first experiences with Alexa. More than 10,000 skills will be available when the service launches to customers in India this month. Saavn, one of the world’s leading music providers, is bringing its selection of 37 million Bollywood, English, Hindi, and Indian regional songs, top artists, expertly curated playlists, and custom radio stations to Alexa using the Alexa Skills Kit. “The same way you would ask a friend to play your favourite song, the Saavn skill for Alexa gives you a natural way to access an extensive music catalogue. We're honored to work with Amazon – our relationship enables us to provide a seamless experience to our listeners instantly. All of Saavn’s songs are yours. Just ask Alexa,” said Jaikaran Sawhny, VP of Product, Saavn. ESPNcricinfo is the voice of cricket in India and globally, and is committed to best-in-class experiences for cricket fans through its live scoring, stats, commentary, engaging content, trusted and insightful analysis, expanding library of video and more. Using the Flash Briefing API in the Alexa Skills Kit, the ESPNcricinfo skill provides fans updates on India’s favourite sport as a part of their daily briefing. “We are cricket fans ourselves and we understand a fan's curiosity to follow the news around the sport from across the world. With the ESPNcricinfo skill for Alexa, fans will now have cricket updates including news, schedules, stats, and more at their command. We are excited to develop this skill with Amazon for customers in India,” said Ramesh Kumar, Vice President, Head of ESPN India and South Asia. 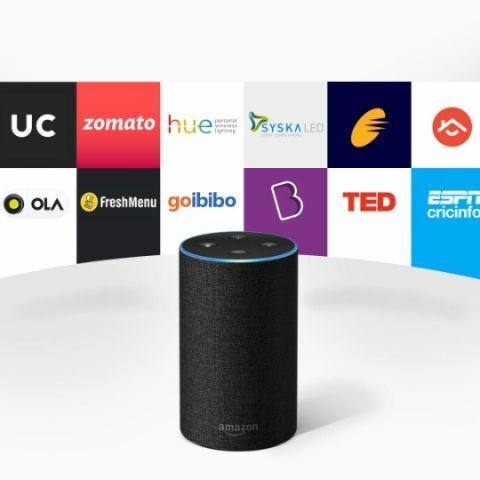 The Times of India, one of the largest English-language dailies in the world, is using the Alexa Skills Kit to enable users to access up-to-the-minute news headlines on demand, just by asking Alexa. “News updates and headlines on demand from your favourite news daily is now just an ‘ask’ away. We are excited to bring the TOI Skill on Alexa to deliver regular news updates for our customers,” said Puneet Gupt, COO Digital News, Times Internet. NDTV, a global news provider and television media company, is using the Flash Briefing API in the Alexa Skills Kit to create a skill that provides customers with the top news headlines from the world of Business, Technology, Bollywood, Cricket, and more, just by asking. “NDTV remains committed to innovation and adaptability and has developed an Alexa skill so our users can now get voice alerts for the latest, fastest and most credible headlines in news, entertainment, sports and more,” said Suparna Singh, CEO, NDTV Convergence. Ola is India's most popular mobile app for transportation and used the Alexa Skills Kit to create a custom skill that enables their customers to book rides and more using simply their voice. “As a leader in smart urban transportation, Ola is excited to work with Amazon to bring the power of voice for our customers. Just ask Alexa to book an Ola cab and see one arrive at your location,” said Rajiv Thondanoor, Vice President of Product Management at Ola. Zomato, the leading global restaurant discovery and food ordering platform used by millions of customers worldwide, is now using the Alexa Skills Kit to make dining out or ordering in even more seamless and enjoyable for their users. “Our motto at Zomato is to make the discovery of great meals easy and accessible for all our users," said, Pramod Rao - Global Head - Content, Zomato. "Through the Zomato skill, users can now ask Alexa to recommend nearby restaurants to dine out, book a table, or even place an order for home delivery using just their voice. It’s another way we’re making the experience dining out or ordering in more convenient and fun for our customers." Freshmenu is a one-stop-shop to order good food online. Their team leveraged the Alexa Skills Kit to enable customers to browse food categories and place delivery orders. “Getting food when you are hungry has never been easier. With our Alexa skill, good food is now easily accessible with a few simple voice commands. Ask Alexa to order from Freshmenu and see your favourite dishes land at your doorstep,” said Rashmi Daga, CEO, FreshMenu. Home services start-up Housejoy will also be available on Alexa as a skill. Customers can now easily call for home repair technicians as well as seek support to install their new home appliances with just their voice. “With busy lifestyles, customers are actively seeking for convenience and high quality when it comes to their home service needs. Through Alexa, we will be able to give customers a really simple & efficient way to book and track their orders. For example, a customer has to just ask Alexa to book a plumber and an expert plumber will reach the location within an hour” said Krishna Mohan Gadi, Vice President – Product, Housejoy. Leading travel search market place ixigo will now help you plan your travel more effectively with Alexa. "The ixigo Skill on Alexa provides a smarter option to pick and choose flights for our customers. It gives a whole new perspective to travel planning, since you could just say ‘Alexa, ask ixigo where can I fly for ten thousand rupees in December?’ and get inspired with varied travel options. From searching & booking flights, to checking a flight status, to even doing an automated web check-in on popular airlines, the ixigo skill offers the most seamless travel planning experience for Alexa users on Echo,” said Rajnish Kumar, CTO & Co-Founder, ixigo. Bollywood fans can now get all the latest updates by just asking Alexa on BollywoodHungama, a popular online destination for all the latest news from the film, music and the entertainment industry in India. “Voice command and AI are the next bastions for consumer delight in the very rapidly changing digital landscape. Hungama has been at the forefront of the Indian media and entertainment content, with BollywoodHungama being an integral part of the Indian film and music industry. We are delighted to enable BollywoodHungama as a Flash Briefing skill and provide our consumers the latest updates, news and reviews from Bollywood with a simple voice command with Alexa”, said Neeraj Roy, Founder and CEO of BollywoodHungama. Faasos is an Indian "food on demand" company that was incorporated in 2011 and operates in 16 of the largest cities in India. According to Soumyadeep Barman, CTO, Faasos, “Superfast ordering experience powered by an intelligent recommendation system is what Faasos and Alexa team have been working on. Faasos Skill on Alexa recommends products basis your history and enables you to order & track your food in seconds. Smart-ordering is the next big step for a food-tech player like us and with this experience, we will be able to provide enhanced customer experience with voice ordering by breaking the clutter in decision making from hundreds of listed products. We invite developers to join the Alexa team at upcoming Alexa Dev Days events, our first webinar for Alexa developers in India, and other in-person events to learn about building Alexa skills. Get started at https://developer.amazon.com/in/alexa-skills-kit. The Alexa Voice Service (AVS) enables developers to integrate Alexa directly into their products, bringing the convenience of voice control to any connected device. AVS provides developers with access to a suite of resources to quickly and easily build Alexa-enabled products, including APIs, hardware development kits, software development kits, and documentation. Through AVS, device makers can add a new intelligent interface to their products and offer customers access to a growing number of Alexa features, smart home integrations, and skills. Starting today, developers can begin building an AVS prototype, and can sign up for the developer preview to be notified when AVS will be widely available for customers in India. HARMAN designs and engineers connected products and solutions for automakers, consumers, and enterprises worldwide. They plan to bring the Harman Kardon Allure, an intelligent speaker with Alexa built right in, to customers in India through the Alexa Voice Service. “One of the most popular uses for digital voice services is music streaming. With Harman Kardon Allure’s premium sound quality and iconic design, and Amazon’s exceptional voice-enabled technology, HARMAN is delivering on its promise to elevate a connected life through smart technology. We’re excited to bring this product to customers in India,” said Pradeep Chaudhry, Country Manager, HARMAN India. Developers can start building an AVS prototype today, and can sign up for the developer preview to be notified when AVS will be widely available for customers in India here.